What a gorgeous boy you are Dash, and so many photos you have let your person take! How nice you won her heart that day in the shop - you knew the person you wanted for your forever human and made your wishes come true! How nice she appreciates you in all your sleek blue handsomeness and those yellow green eyes are quite compelling! Congratulations again, cutie! You are Cat of the Day for the whole world to celebrate! This is my playful, independent, cuddly kitty, Dash! He loves to play outside, running and climbing trees and even taking walks with me, he only goes inside to sleep! I adopted him very unexpectedly when I walked into a pet shop and saw a little gray kitten and he rubbed up against me through the bars, and I just HAD to get him! He's just so loveable! As handsome as he is, he's also very ornery. When he's inside not sleeping, he sneaks into the bathroom to sleep on the toilet, or steals the other cats' food, or comes into my room and starts biting my head! But I still can't get mad at him for long ... Dash is my baby and I love him very much! Hello, Dash in Texas! Happy, happy Cat of the Day to you! What a handsome blue gentleman you are! You chose your person that day in the shop! Your fur looks so plush and soft to pet ... I like your gem-like green eyes! I am glad your person sent all these wonderful photos, because you are a camera star! You are a busy guy ... playing outside, going for a walk with your person and observing all that's going on! You are a little bit ornery... biting your person's head . You steal the other cats' food. You have an interesting choice of napping spots too! Best of all, you are a greatly loved kitty! Happy Cat of the Day to handsome Dash! Dearest Dash, you are gorgeous! What a stunningly beautiful grey kitty you are! That plush grey fur is luxurious and looks so soft, and you have the sweetest face with those lovely big golden-green eyes! Thank you for sharing all those great photos with us. What an amazing gallery! They capture you in so many different activities and so many different moods. I wish I could reach through the screen and down to Lampasas, TX to pet you, and pet your kitty housemates, too. I can't, of course, but I know your loving and beloved Purrrson will pet you all for me . And what a delightful Purrrsonality you have! You were a tiny kitten in a pet shop, and one day your dear Purrrson walked in.. and the rest is history! You are playful, independent, and cuddly. You're full of energy and love to play outside, running and climbing trees and walking with your dear Purrrson. You can be ornery at times, sleeping on the toilet, eating the other cats' food, even biting your Purrrson's head! You and he/she love each other very much, don't you. What a wonderful love-filled home you share! 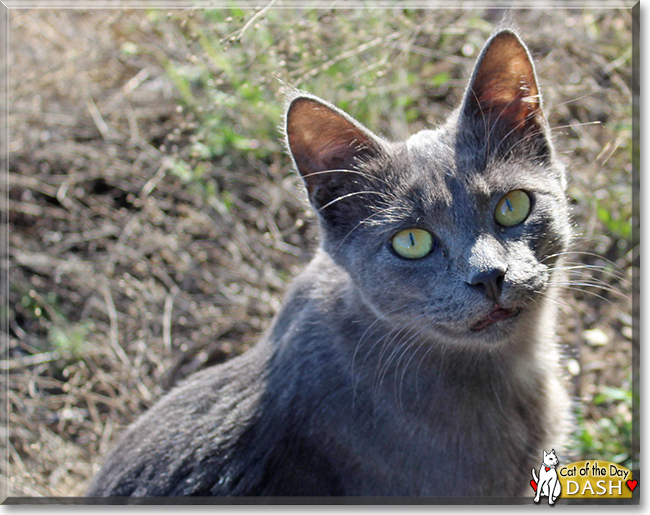 Congratulations, darling Dash, on being chosen today's Cat of the Day! We hope you and your dear person and kitties and all your family and friends are enjoying a fine celebration, full of fun and lovies and all your favorite games and treats. It's pretty clear why you are mad about Dash! First of all, what a looker  Such a beautiful blue-grey coat and georgous, mischievous face! Seems he's filled with love and life living it to the fullest. Such a magnificent, wonderful COTD! Hi Dash! Happy Cat of the Day! You truly are one devilishly handsome fellow, Dash! Your sleek, grey coat and sparkling amber eyes are simply gorgeous! Many thanks to your human for sharing so many beautiful photos along with your backstory! How lucky your human is, having been chosen by you to be your furever human! Just one brush through those bars and the deal was sealed! It's no wonder your human fell in love at first sight; how could she/he resist? How lucky your human is, having a beautiful, energetic, sweet and loving furkid in you, Dash! You're the best! Thanks for the BIG smiles sweetheart! Meeting you tonight has been a real treat! Hope you're having a very special Cat of the Day celebration, enjoying fun time out in the yard, running and climbing trees, snitching some of your furry sibs' food, hehe, cuddling with your human, being loved and pampered to pieces! Lots of love, cuddles and kisses to you, adorable Dash, our very special and most deserving Cat of the Day, EVERY day! Dear Dash, what a handsome boy you are. Your grey fur is so soft looking, and your face is so beautiful and it has so much character. Your photo spread is fantastic, the camera definitely loves you! You knew exactly that your forever person was stepping into the petstore, and you made sure you would be noticed. You are a very headstrong kitty, and you know what you want, like sleeping on the toilet, eating the other cats' food, and biting your person's head. You are also a very active outdoor kitty, climbing trees and taking walks with your person. Dash, you are beautiful inside and out, and I wish you, your kitty siblings and your family a great day full of celebration, and many more happy and healthy years together. What a handsome gray kitty you are, Dash. Dash is such a handsome cat. Do think he might be a Russian Blue?